I have been thinking about ruffled shirts lately! I REALLY want to make one....or at least something I can wear that has ruffles! ...so here are some fun ideas! THat last one is YUMMY! Love your blog. I stumbled across your blog, and I think it's really cute! Have you heard of ruffles and stuff? She's having a massive giveaway, you should check it out! 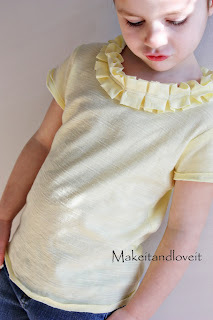 You have really cute ruffled things, and that's what the giveaway is about.